Hello! I’m so excited about this month’s Card Kit from The Stamps of Life . It’s a beach theme! My most favorite place to be! Sending Smiles Card Kit is filled with so much goodness! Watch Stephanie’s video HERE to see everything included in the kit! I had so much fun making these cards…. 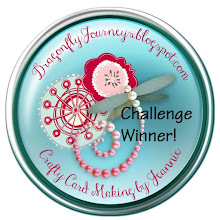 I LOVE making shaped cards and used W Circle Dies Set as my card base. I decorated my card front with patterned paper, a chipboard sailboat, anchor and stars all included in the set. Here’s a look at the inside…. Here’s another fun one I made pairing the card kit with Shells2stamp Dies. I often struggle with masculine cards but not with this kit…. There are a few different chipboard sailboats included in the set. I love the patterns on this one! I trimmed the small “wave” of chipboard water to fit on my flip-its and added it to my card. I absolutely adore these nautical patterned papers! I hope you enjoyed today’s cards and I inspired you to make some of your own! I hope you have a wonderful day! Happy card making! Hello friends! I have a darling little box to share with you today featuring Petal Box Dies from The Stamps of Life! How sweet is this little box? The box set comes with several different flower dies and layering pieces giving you many different options when making your box. I finished my box off by stamping “thank you” and adding a small bow. The box is just perfect to surprise someone with a little treat, party favor or even made into an ornament! For my next sample, I made a tea bag holder….. simple and so cute! I paired my box with moretea4us stamps and dies. I think it would make a cute get well, tea party favor or “just because” trinket to give to someone. The Petal Box goes together quickly and easily! You can see Stephanie demonstrate HERE and see just how easy it is! You can also find additional ideas here, in the Gallery. Thanks for stopping by! Wishing you a wonderful day! Hello friends! Happy April 1st! I’m not sure how March escaped so fast, but I DO know that warmer weather is coming soon and so isn’t my favorite season, summer! I LOVE summer and going to the beach which is why this month’s Club Set is one of my top 10 favorites! lighthouse2stamp is a beautiful set with lovely sentiments…. In addition to the Club Set, I created my water with Border Dies and added the sun to my sky. This time I only used the dies for my lighthouse. I simply ripped the edge of my glitter paper for my water and I stamped the Sunburst for my background. Lastly, I stamped my sentiment and added an anchor and twine to the side of my card. A very simple card… but sometimes I think less is more, especially on this card. Thanks for stopping by today! I hope you enjoyed today’s cards. Everything I used to make my cards can be found HERE at The Stamps of Life. I hope you have a wonderful week! It’s official… it’s the first day of spring, YAY!!!! This little bunny arrived just in time at The Stamps of Life and is the latest shaped card to join the Fold-its Collection! So fun and so cute!!! Look how adorable the Bunny Fold-it is! I LOVE shaped cards and this bunny is so cute! The Bunny Fold-it comes with 4 different dies…. You can use just the dies included in the set or add other Stamps of Life stamps, dies or accessories to your bunny…your choice! Either way, it sure makes an adorable Easter or springtime card! Hello, friends! It’s time for another new release today at The Stamps of Life. If you like interactive cards, you’re going to love this set! The Pocket Slider Die Set is so much fun! I love the versatility of the Happy Birthday die that is included in the set! Here is where the interactive part comes in… pull the ribbon attached to the tab and a secret message is revealed! Fun! I finished my card stamping birthdaygreetings2stamp for an added sentiment. Here’s another sample of an Easter card I made pairing bunnypudgie12 with the die set and the Adore Collection Card Kit. This time, I paired it with the You Are A Flower In My Life Word Die and wheelbarrow2stamp. And the inside message… using moremums2love and friend. There’s an adorable new baby stamp set that was released at The Stamps of Life today. baby2stamp comes with 10 stamps and has a matching die set that is sold separately. I had lots of fun making these samples! Same style card, but I personalized this one for my new little great nephew! Another fun one… Being a mom to three boys, I clearly remember the nights of no sleep! And one last sample….Isn’t this little cradle so sweet? I love it! I think this set is so cute and was very happy to have it added to my collection! Everything I used to make my cards today can be found HERE at The Stamps of Life. Hello! And just like that, it’s March! 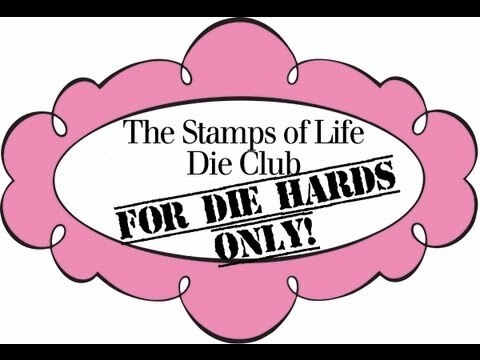 It’s also time for a new Club Set release by The Stamps of Life and this one is lots of fun! Who doesn’t like ice cream?!!! bananasplit2stamp is this month’s Club Set ! I love making shaped cards, so I thought it would be fun to make a circular one using the “W” Circle Dies Set as a card base. It’s always fun to switch it up a little! And here’s the inside of the card… The cherry stamp makes a fun pattern. I layered my banana split on to Scalloped Rectangles and the Exclusive Stitched Rectangle Dies to make this card. Really simple, but fun! Thanks for stopping by! I hope you have a wonderful day! Until the next time… Happy Stamping! Hi I'm Leslie! I'm a wife of over 30 years, and a mom to 3 grown boys. My job is a Kindergarten Paraprofessional, which makes me smile everyday! I have been making cards for over 10 years and I absolutely love it! I hope this blog inspires you to create your own cards from the heart. Enjoy and happy stamping!